I usually don't wear jeans or sneakers. I had a traumatic experience with constricting denim a few years ago that still haunts my fashion consciousness to this day. I was wearing a pair of True Religions at a Lakers playoff game and after a meal of burger and fries, I felt a sharp jabbing pain in my stomach. The pain was intolerable to the point I contemplated leaving Staples Center for the emergency room. But I couldn't. It was the playoffs! Instead, I went to the restroom and unbuttoned my jeans. Instantly, the pain went away and I felt like a fat idiot. I had to wear a baggy Laker t-shirt the rest of the night to hide the embarrassing truth of my gluttony-my jeans couldn't handle my dinner. Since then, I've been wary of wearing jeans for more than a few hours in fear of another unbuttoned embarrassment. As for sneakers, they're usually just not fab enough to wear outside the gym. However, stretchy denim and wedge sneakers are having their moment right now and I just couldn't sidestep two of fall's hottest trends without trying them out. When my friend Kristen (fashion publicist/fashion blogger) invited me to a preview dinner at Bestia, downtown LA's hottest new Italian restaurant, I decided to zip up a pair of stretchy leather coated jeans and step into burgundy wedge sneakers for the dinner. A hot pink fitted blazer and leather sleeved tee completed my dinner look. I like the oxymoronic contrast of the primp and proper blazer with the casual tomboy appeal of the jeans and sneakers. Dinner was amazingly authentic. 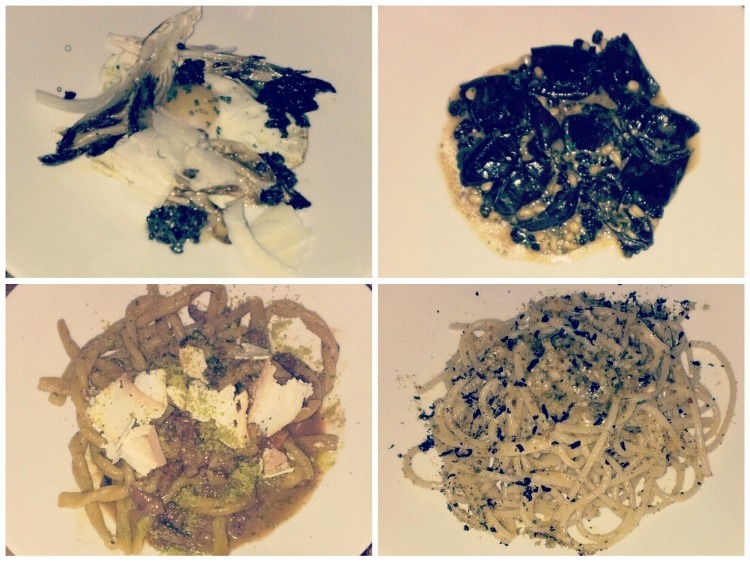 Bestia's head chef worked at Angelini Osteria so he knows Italian. Bill Chait, the restaurant's head investor brought Picca, Sotto, and Short Order to LA so he knows good food and good talent. The restaurant sits in the industrial artist loft area of dtla infusing a vibe of modernity to its rustic fare of traditional Italian pastas, pizzas, meats, and seafood. We tried half the menu and was disappointed by none of the dishes. 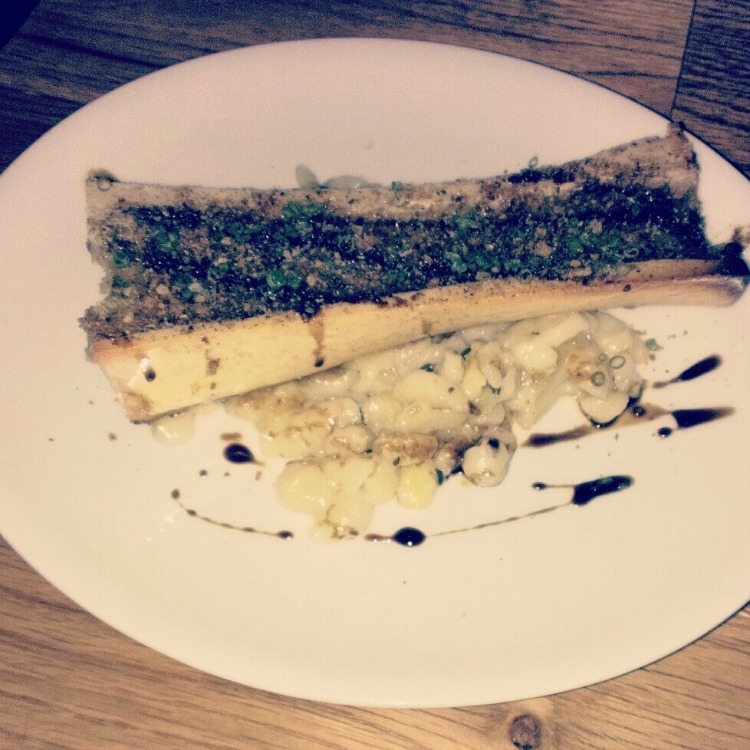 My favs of the night were the perfectly seasoned bone marrow and the spaghetti imported from a small town in Italy and considered one of the most expensive noodles in the region. It's cooked al dente and has a chew to it that parallels local eateries in the hidden gems of the Tuscany valley. The goat cheese ragu paparadelle also lingered in my foodie memory bank as the meat sauce was insanely addictive. 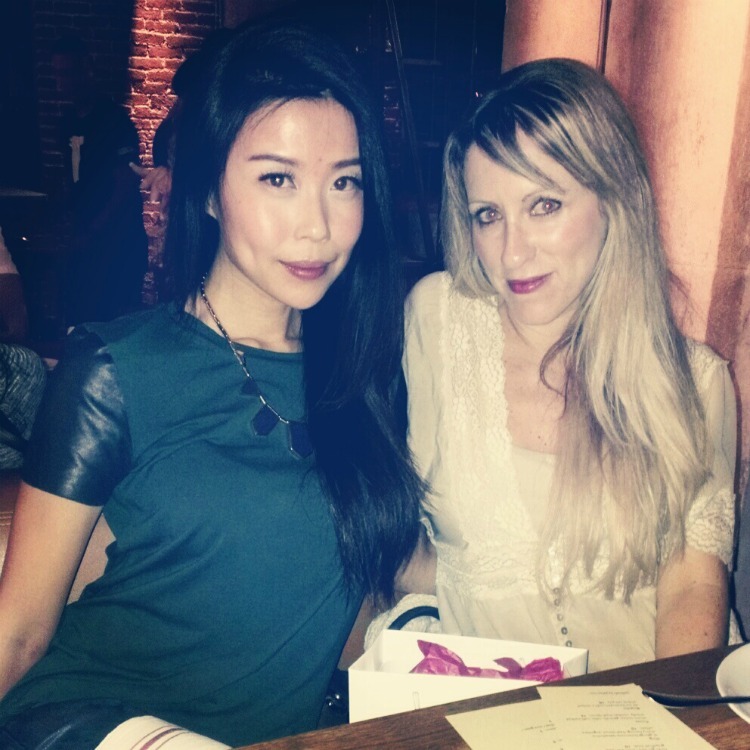 I love eating good food with good company and am happy to report I stayed buttoned up and pain-free all night! I understand the jeans too! I hate wearing jeans, I always wear dresses! But I love the sneaker wedge trend! Cool shoes! Great color combo! Thanks for visiting my blog! I'm your newest follower :) I hope you follow my blog too! I love these looks, especially the one at the restaurant - you really don't even need beautiful clothes to look beautiful! I'm your newest follower. you look gorgeous, love the denim and sneakers! I think this is super fun! Kind of pop culture meet punk glitter. Jeans aren't nearly as comfortable as people make them seem. But at least those ones are really cool! I'm a bit confused about the "leather-covered denim"... is this just an effect? I can't imagine how it could be done in real life. The jeans looks georgeus cute blazer! I love the leopard bracelet!!!!!!!!!!!!!!!!!! You look gorg. Love the color combo and LOVE thoe pants! I love the jeans!! you look great! !Thanks for you comment, Visit http://urbanfashionstylee.blogspot.mx and check my new post!! adore that style. especially the pink blazer you look great! i love your look .. wonderful jacket and super pants!!! I am loving this colorful look of yours. The pants look so so cool! you are SO pretty! love this shoes! 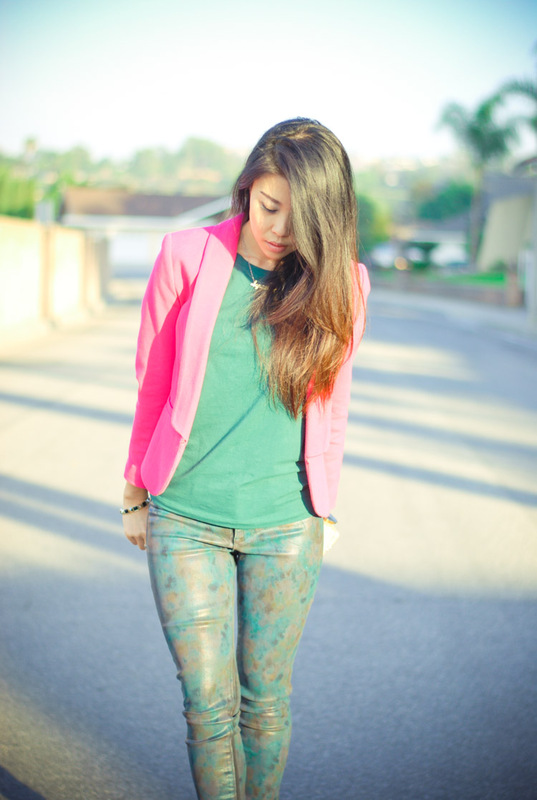 love this look, especially that blazer!!! 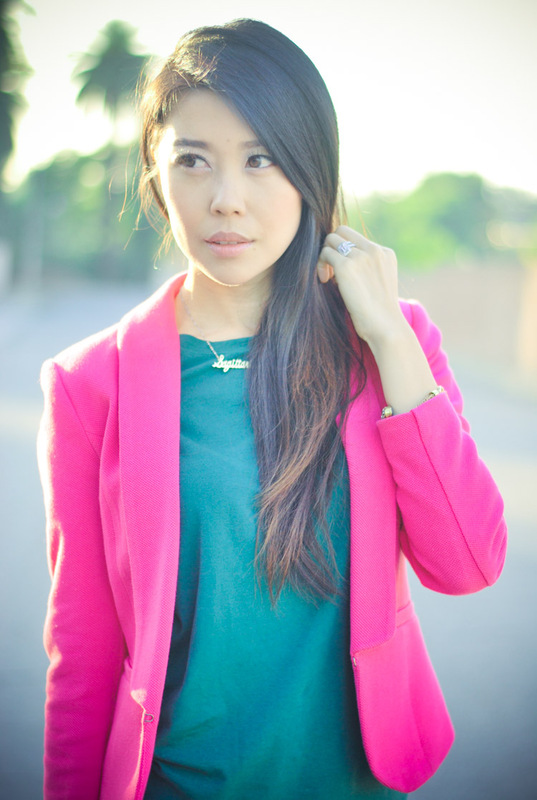 What a great look, I love your burght pink blazer and the panter bracelet, so fierce! Love your wedge sneakers, did you buy it at http://www.upere.com/upere-wedge-sneakers-c-1.html, gorgeous and amazing. Love the jean a lot, colours are well matching. From where did you buy it?